As back as far as I can remember I have been overweight. Growing up I can remember being different as early as 5 years old. I was easily the biggest kid in my class and it just got worse as I grew older. I definitely felt different as a kid and even a teen into early adulthood. I was never short on friends. I was the funny girl. I was outgoing and friendly to everyone. I never dated and I always felt left out when all my friends had boyfriends. I was obese since I was a child and all through high school and college I always felt depressed and alone and I often blamed my weight. My dad is a dialysis patient who recently lost his legs to diabetes. Several years ago he had complications from dialysis and his heart stopped. We didn’t think he would come out of his coma. When he did I vowed that I wouldn’t let myself end up like that. I realized that at 265 lbs and 28 years old, I could die way too young. 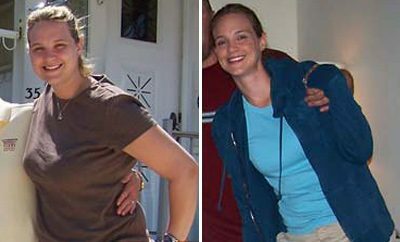 I gained and lost the same 30 lbs for years after trying to commit. It wasn’t until I met my now husband that I found a reason to live. When we got engaged, I realized that I wanted to live a long and healthy life with him for as long as possible. LOVE changed my life through both my dad and my husband. I started out making small sustainable changes. Like I always say, “too much too soon is a recipe for disaster.” I cut out fried foods. I cut out fast food. I cut out sodas and sugary drinks. When I felt like I had mastered that, I moved on to cutting out more processed foods. I still didn’t cook much and definitely didn’t exercise, but I was trying new things. Eventually I cut wheat and all white carbs. I started exercising doing just cardio like elliptical and water aerobics. Eventually I added in strength training and weights and it boosted my metabolism. I cut out all processed foods, dairy, and sugar. I cook 3 meals a day 7 days a week (I meal plan and prep every weekend) and do Interval exercises now. 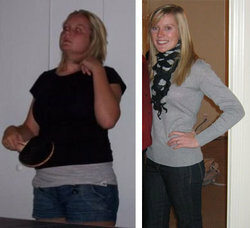 After I initially cut out fast and fried foods, I lost 30 lbs really quickly! I stagnated for a while until I became very determined. After the commitment and showing consistency, I was losing an average of 2 lbs a week for a year. My biggest challenge is myself! I can get very discouraged very easily if I allow negativity to control me. I am my own worst critic. When I don’t do my best, I tend to emotionally beat myself up. I’ve had to learn to let it go a little bit and to be gentle with myself. I’m only human and I will struggle. I hated exercise at first, (it’s still not my favorite) but I found things that I enjoy. Most importantly, I found that changing up my exercise is crucial for me to be successful. My body gets too used to whatever I’m doing and it doesn’t challenge me anymore. Adding different exercise classes, increasing weights in strength training, and even trying running has helped me enjoy it. Other challenges I’ve faced have been allowing myself to believe that I’m not doing a good enough job. My emotional health has held me back in the sense that I always think I could be doing more. I have a drive to succeed so when I slip up on my diet or I skip the gym for too long, I’ve had to learn to understand that life happens and it’s ok. I have to have balance. I still struggle with the idea of giving up! I think to myself, “well, just eat until you feel better” because I’ve always been an emotional eater since I was a child. I struggle every single day. I’ll get into a really good groove with exercise and diet and then I’ll slip up and give myself the go ahead to just binge. It’s not normal, but it’s also not healthy. When I was in the middle of losing all the weight (about 60 lbs lost at that point), I was so frustrated with plateaus and stagnating. I admit that my wedding was a big motivator. Not only did I want to look good in my dress, but I wanted to prove to myself that I would not be an obese bride. I kept telling myself that I was totally capable of achieving anything I’d ever imagined. I wanted to quit so many times, but I didn’t want to end up sick like my dad at an early age. Plateaus are inevitable. Everyone will have them. I feel like I had several. I plateaued at 3o lbs lost, again at 50, again at 80, and then right at the 100 lbs lost mark. I’m still not at my goal, but I’m comfortable where I am. 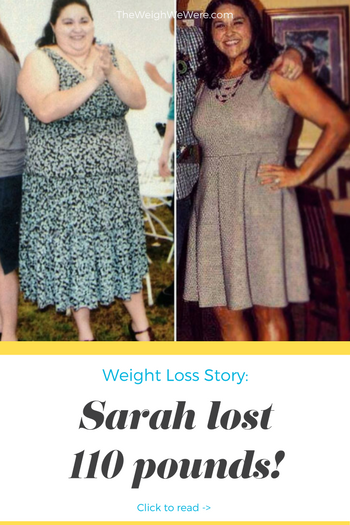 The problem with losing so much weight is your metabolism slows down so when you start to lose a few lbs, your body wants to hold on to every ounce desperately! If you do it right and don’t starve yourself, you will break through by changing things up a bit. I cut wheat early on, but when I plateaued in the middle I went low carb (no oats or rice or sweet potatoes) for a while to jump start things. 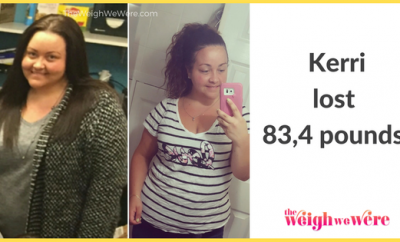 When I added weight training I really broke through a plateau! I can’t stress how much it helped me! Plus, I got toned! When I went more plant based in my diet and increased my water to almost a gallon a day, I really noticed my hunger level went down thus my plateaus were gone! I started in 2010 and lost 30 lbs but by 2014 I had gained almost all of it all back. When I really got serious in August 2014, it took me until October 2015 to lose 100. I lost another 10 within a few months afterwards. 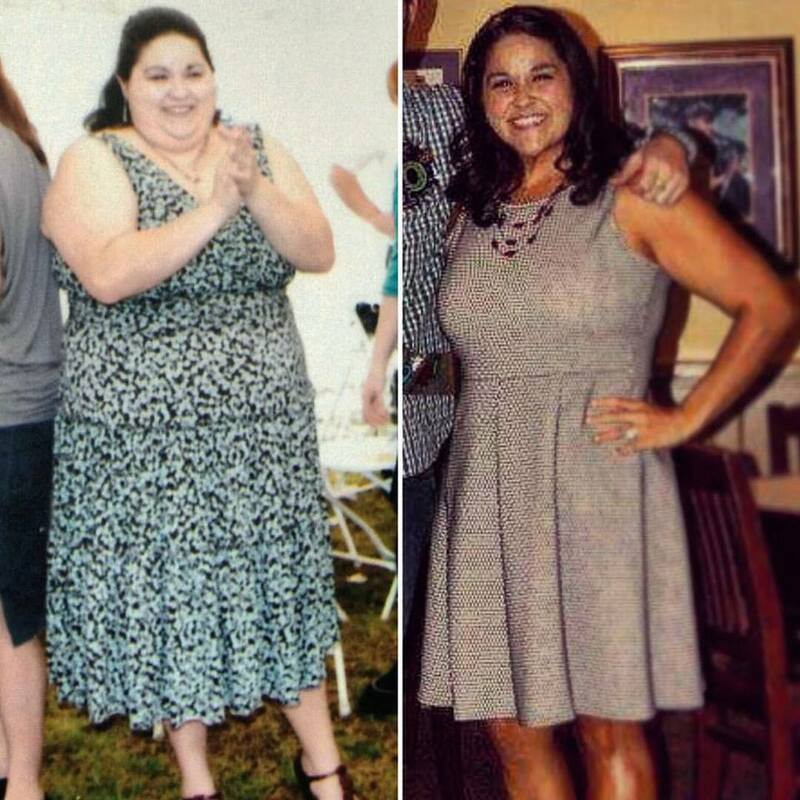 I bought my wedding dress before I lost all the weight knowing I was having a long engagement. I had to take the dress in 10 sizes and essentially have it remade! That was a huge accomplishment! I have lost over 50 inches total all over my body! I am strong, I can lift heavy weights, and I’m 12 sizes smaller than when I started. Other non scale victories are being able to do fun outdoors activities and not get tired. I love hiking and being outside! I can climb stairs and my knees don’t hurt. I can walk miles and miles and never feel tired or winded. Every time I can shop in the non plus size section is a non scale victory!! My diet now compared to my diet then is like a completely opposite menu!! I eat whole foods only: fruits, nuts, seeds, EVERY vegetable, lean protein, and complex carbs now. no fried foods, fast food, no sodas, nothing that comes out of a box or a package, no alcohol, no refined sugar, no dairy, no wheat, and I don’t miss the way I used to feel eating it! Life is about balance. I love cake. I love chocolate. I love a good Southern meal here in Louisiana. I don’t believe in “never.” I believe that you can have something once in a while, but it doesn’t have to be every day like it used to be. My life is completely different. I can’t sit still now! I used to be a couch potato. I’m sure it was partly due to depression and lack of energy, but now I’m on the go always! As a nanny, it’s important that I have a high level of motivation to keep me moving all day. I love to bike, walk, hike, and go on any adventure! Back at my heaviest, I could barely climb stairs. Don’t eat past 8 pm! Remove all refined sugar from your diet! Even Ladies: lift heavy weights and do it often! Cardio interval training is the best! It’s like pushups for your heart. You burn calories long after you are finished! Try a HIIT workout today! Chug water like it’s your job! Stay hydrated. Drink a glass first thing in the morning and keep an alarm on your phone to remind you every hour to drink if you have to!